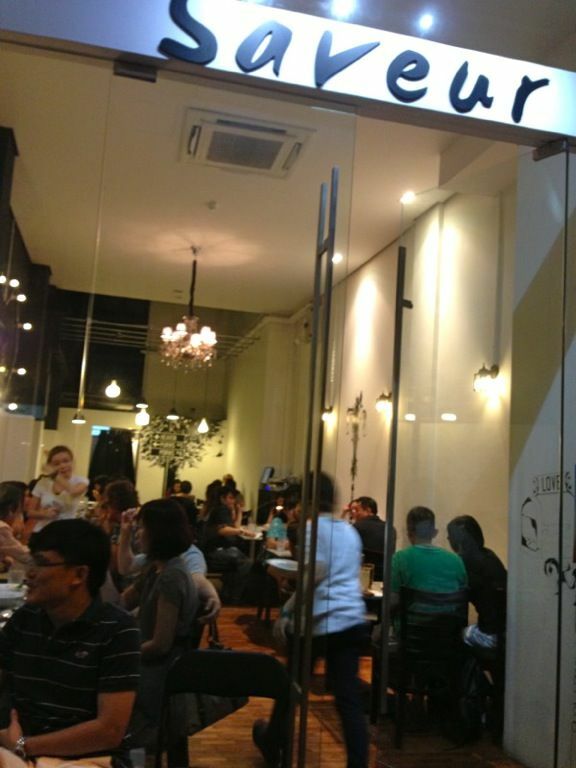 Saveur is known as the decent and highly affordable French food for the masses in Singapore. 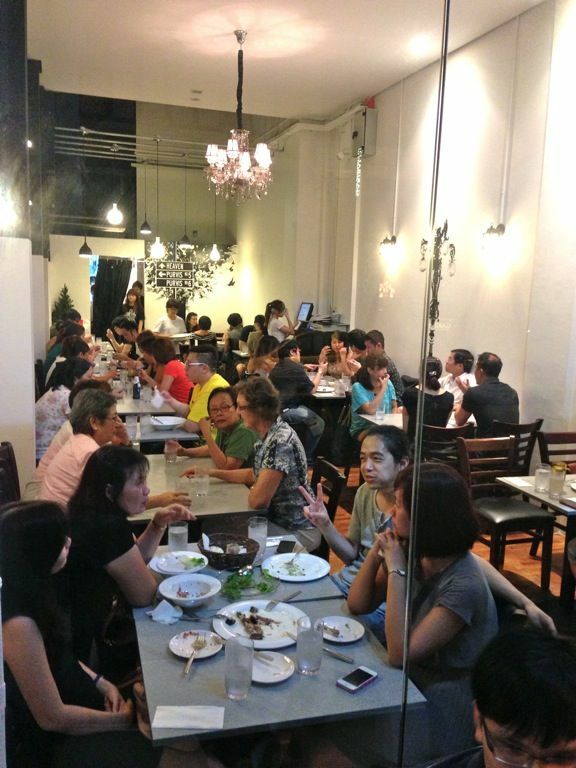 Since their humble beginnings at the Ali Baba Eating House (i'm serious) in Katong, the young chefs have gone a long way and have even made a mark for themselves at Purvis Street. My friend said that they have expanded from their original store front the next store in order to meet the demands of the customers. We didn't make a reservation as we were under the impression they do not take any (i'm still unsure). At 7pm, we had to wait 30 mins for a table for 7. As we sat there waiting, the wait time given to the other customers increased from 15 mins to a good 45 mins. For starters, we had the Signature Saveur pasta tossed with chili oil, fine-chopped Japanese konbu and sakura ebi with minced pork sauce ($4.90). This is the Italian version of our local minced pork noodles. 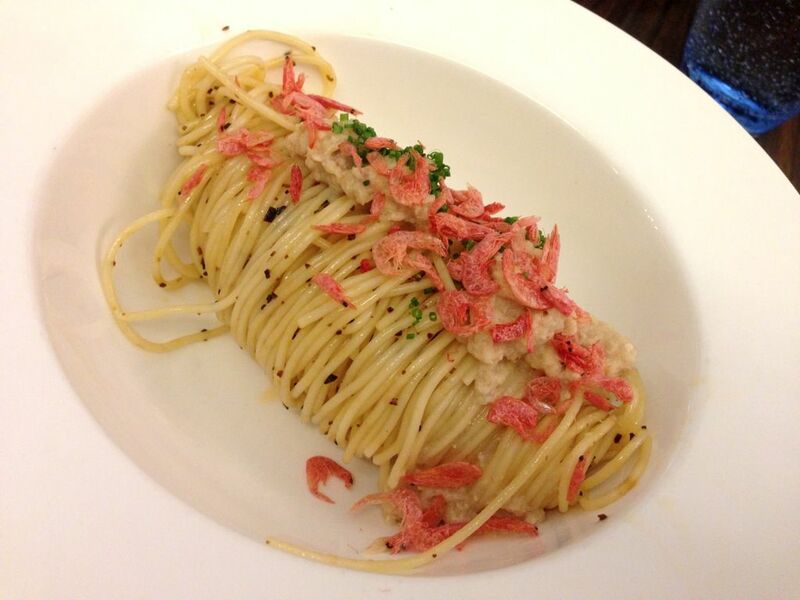 The texture of the angel hair pasta makes it more delicate than its fat mee pok cousin. Kind of reminded me of Iggy's signature cappellini. Of course, every cents count towards the quality but this is not too shady. 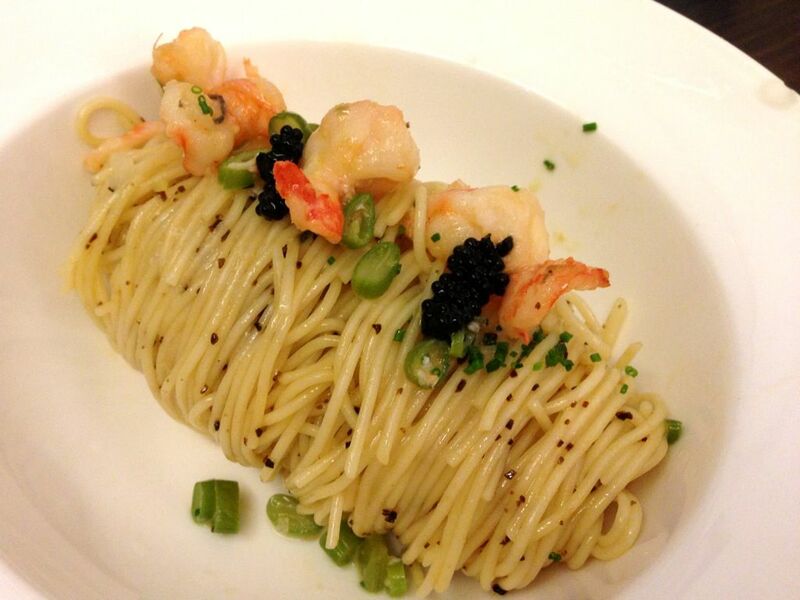 From the Special menu, the Seafood Pasta with Tiger Prawn and Lumpfish Caviar ($6.90) is also a crowd pleaser. Perfectly al dente noodles which is well flavored by the natural seafood sweetness. The taste is lighter than the signature pasta and the spring onions gives each mouthful a refreshing burst when you bite into them. Prawns are a wee small though but it's only $6.90. Portions are small, about a 12cm long roll but it will fill you up together with a main course order. If you want something smaller, perhaps pick from the 2 different pan-seared Foie Gras: One served with creamy lentils and pickled pearl onion ($7.90) and the other with apples infused with port wine and vanilla bean ($9.90). 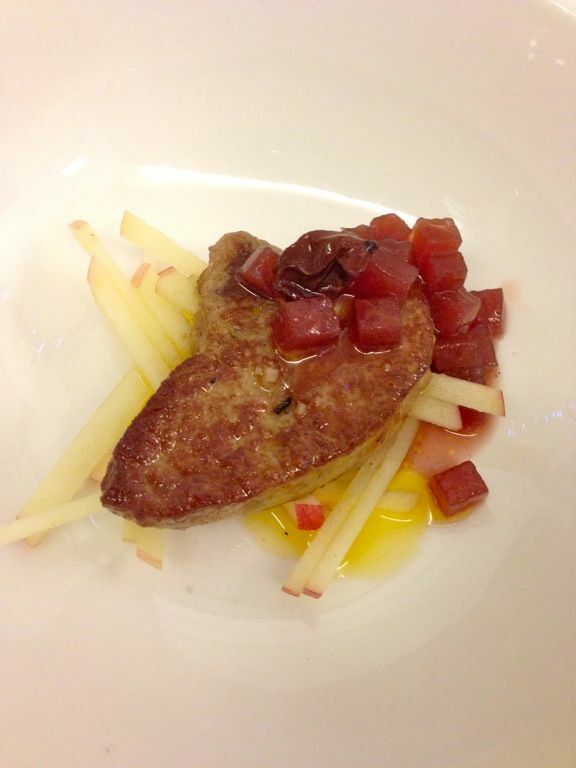 I wasn't too much of a fan of their foie gras as it was on the grainy and powdery side. La Petite's (another cheap French place at Serene Centre and Thomson) tasted better in my memory. Duck Confit ($10.90) is their hot favorite. 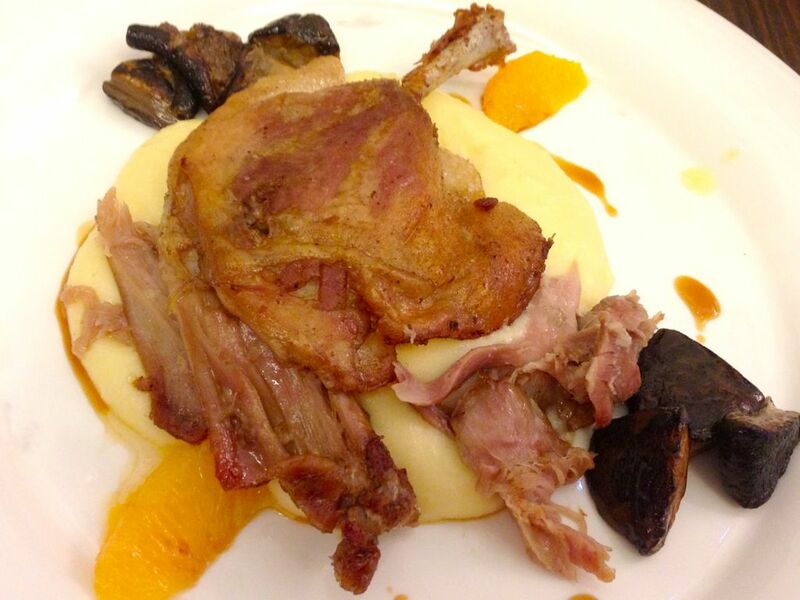 The flatted and pan fried duck leg was served atop homemade mashed potato with saute shiitake mushroms, orange segments and orange infused natural juice. I like that the meat wasn't too salty or dry and the creamy thick mash helped to give it a little moisture. It may look small but i was very satisfied even after giving S a few bites of my dish. 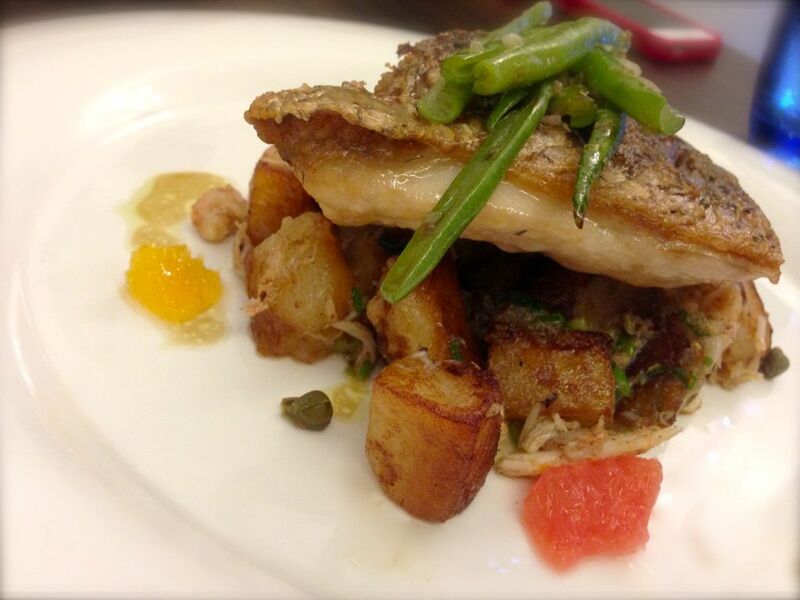 The Pan-seared sea bass with diced saute potato with crabmeat, french beans and caper vinaigrette ($14.90) was equally tasty. Fresh and juicy fish with a crispy exterior but it still maintained that smidgen of fats under the pan fried skin. The potatoes were nicely flavored with the crabmeat and herbs. 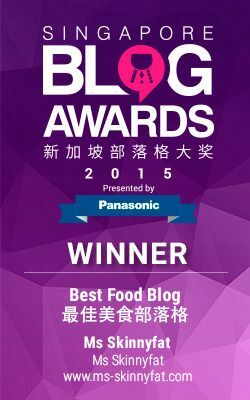 If Duck or Fish are not your cuppa, there is also the braised beef short ribs in red wine ($14.90) or oven roasted beef tenderloin ($24.90) if you are in the moo mood, chicken and pork are also available. 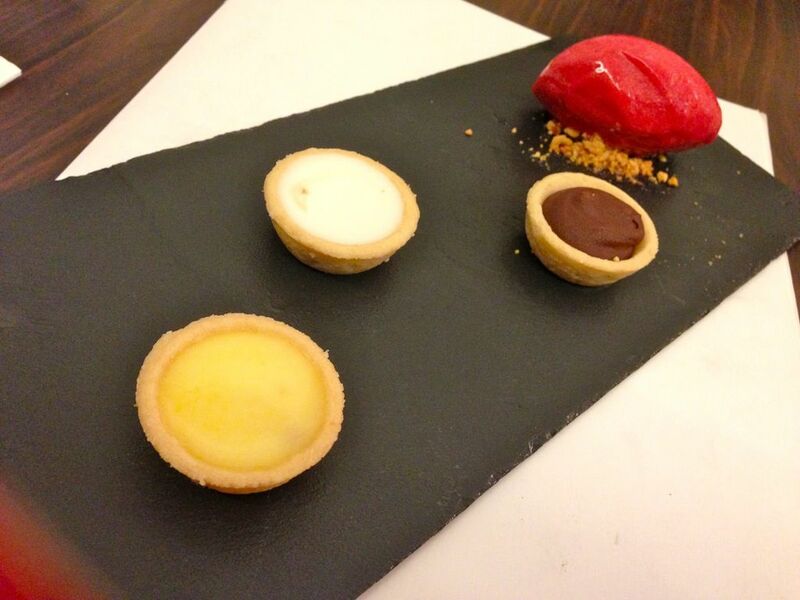 As for desserts, we had the Special Tarts: Lemon Curd, Gula Melaka and Coconut, Araguani Dark Chocolate Tart and Raspberry Sorbet ($9.90). The tarts are smaller than 1.5inches and i like the lemon and coconut one. Bite into the light coconut tart and it would reveal its moist gula melaka center (brown coconut and cane sugar). They should really make this a bigger tart. 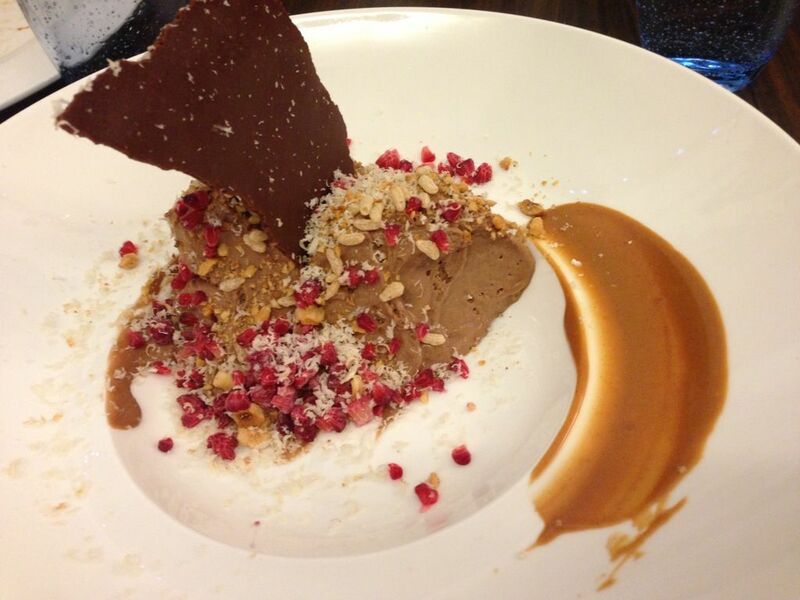 Chocolate & Hazelnut ($7.90)- chocolate mousse with crushed hazelnuts, broken raspberries and roasted rice puffs to give it that extra crunch. 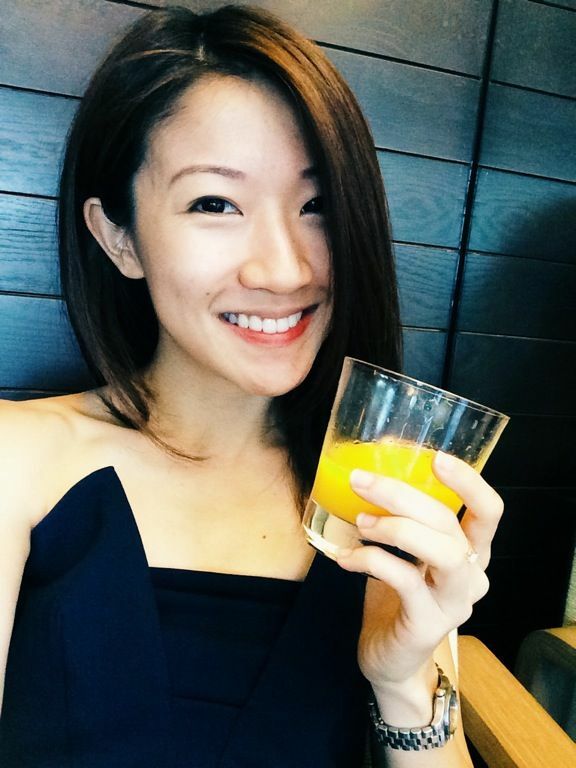 I'm not a huge fan of mousse but i like the different textures in this one. The raspberries also add a nice zing of sourness to the sweet mix.